Loquat Giveaway Responses – What pie do you like? 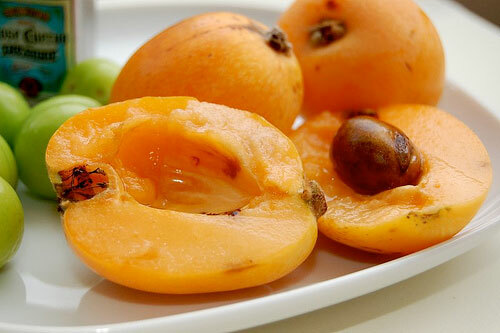 By Christian Cunningham|May 8, 2009|Comments Off on Loquat Giveaway Responses – What pie do you like? Now even though we draw the winners at random, we enjoy asking questions because sometimes the answers are funny - even hilarious - and make our day jobs go by faster. And this contest did not disappoint. There were so many good responses that I've decided to create an entire post full of some of the best answers we received. So what do our readers think is the best fruit made into a pie? It's not an easy question to answer. Are you asking, "which fruit pie do I like best?" or are you asking "which fruit is the best to make pie with?" The first question assumes I am eater and the second assumes that I am baker. I have not tried all fruits so, I kinda' feel parochial and small-towny when I think that I only know a handful of fruit pies - like apple and blueberry. And I have no idea how to bake...if I answered apple, and apple pie baking as it turns out requires huge amounts of resources and that many people needlessly risk their lives during the process, well, that would make me look foolish, now wouldn't it? So I am going to say rhubarb. Just because. - Steve R.
I'm not a fan of any baked fruit, but my husband declares peaches are the best fruit fit for a pie. Why? They taste like summer. - Stephen H.
Trick Question. Pecans aren't fruit. - James K.
So, the best fruit to ever be in a pieâ€¦ is a Mango. Iâ€™m not sure if anyone has ever done it. But it sounds damn delicious right now. - Dustin M.
What about you? Let us know in the comments. Railcars - life of st edmund (ponds) + "CASTLES"